The beaches of South Africa easily rival those of the Caribbean, acres of white sand scattered with sea shells, blue seas and good facilities such as restaurants and cafes. One thing you will find in South African seaside resorts is that everything is clean. The public toilets will be spotless, accommodation of a good standard and clean, the town centres are clean. There are hundreds of beaches all around the coast. Some people make a beeline for their favourites such as Coffee Bay on the east coast but sometimes it is better to book your stay based not on the beach, but on the associated activities you would like to enjoy for days out because there are so many good beaches everywhere. South Africa is a good destination for a beach holiday because the sun is virtually guaranteed during the summer. 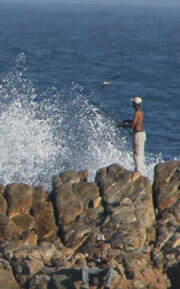 The Atlantic coast is colder than the Indian Ocean coast and there are excellent beaches with good waves in many areas. The advantage of including a beach holiday during your trip to South Africa is that it gives you time to relax in between excursions to view wildlife, shopping, wine tasting, fishing and any other activities that might be of interest to you. It is this range of additional optional activities that makes South Africa one of the most exciting and pleasurable destinations on earth.